It's been a while since I left a simple photo post but I thought this was so cute and wanted to share! Gracie has not long learnt how to draw people. Mainly being the typical circle with eyes, mouth, arms and legs and she loves to associate her pictures with her family telling us she has drawn mummy or Daddy etc. 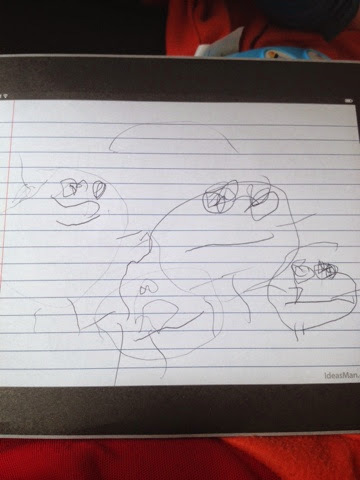 A few days ago I gave her a little notepad I received at Blog On Mosi and she amazed me by drawing a picture of 'Gracie's family' this picture is apparently Mummy, Daddy, Gracie and Zach. I love it and have photographed it so we always have the photo to look back on. She did follow this up with a picture of her, Daddy, Zach and 'baba' though with no mummy as I wasn't allowed in the picture! Not so cute! What do you think? Do I have a budding artist in the household? !